Lanham, MD – a.i. 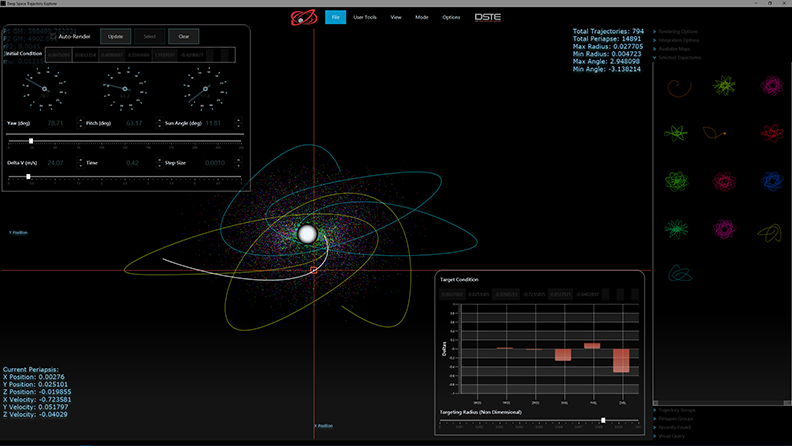 solutions’ Deep Space Trajectory Explorer (DSTE) Quarter 1 software release contains new features and functionality in BCR4BP and AH3BP Equations of Motion, Transfer Trajectory Tuner with Target Overlays, State Vector Import Options, a Quick Navigation Screen, and 3D Interface for Generating Poincare Maps. Two new force models are available in the Q1 Beta release. Under the “Integration Options” menu in the DSTE right-hand panel, the user may now select an implementation of the Bicircular Restricted 4 Body Equations of Motion, specifying the initial angle of the distant 4th body. In addition, the Augmented Hill Restricted 3 Body equations of motion are available, specifying a beta value representing solar pressure. These two models join the original Circular Restricted 3 Body Problem equations of motion. Each model may be used for map generation or individual trajectory propagation. When a map is created, the force model used for generation is recorded, so that a click on the map reproduces the trajectory associated with the points in the map. The user may also select the “override maps” option to propagate forward with the dynamically selected EOMs. The transfer trajectory tuner allows the user to apply an impulsive maneuver at a selected periapsis point. By adjusting the magnitude and direction of the dV and the duration of the post-maneuver integration via dials, the resulting trajectory changes dynamically. The proximity of the trajectory to a selected target point in both position and velocity appear in an overlaid bar chart. To facilitate data import from other tools and repeatability of computations, DSTE now supports drag-and-drop state vector import. After saving a state vector to a text file, the file may be dragged onscreen, and the state vector is propagated forward according to the specified integration options: force model, step-size, and duration. 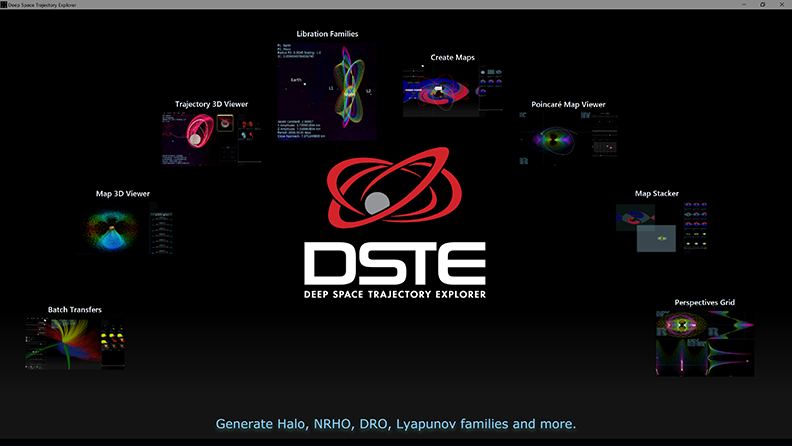 Upon opening DSTE, the new welcome screen provides icons for navigation to major features, including map generation, 3D trajectory viewer, perspectives grid, map stacker, and others. The new map generation screen provides an interface for generation of periapsis Poincaré maps. 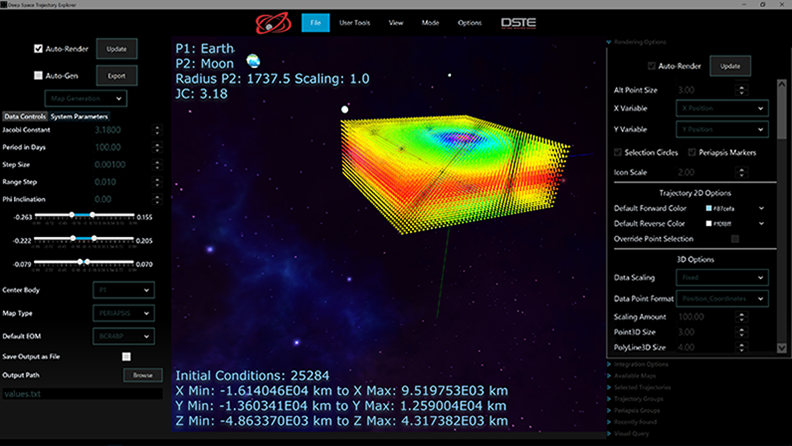 Augmenting the existing configuration file-based map generation capability, the GUI visually represents the grid of initial periapsis states. The user visually specifies system constants, cube shape and density, integration time and other parameters. With button click both the configuration file and Poincaré map are generated, dynamically rendering on screen. Currently, libration point orbit families are computed starting from a text-based configuration file. To augment this capability, the DSTE will be updated to allow a user to generate families directly from the DSTE GUI. Certain families will be available from drop-down menus for fast generation. The user will optionally specify system parameters onscreen with an initial guess for the first family member, allowing the generation of families that are not yet cataloged. To augment mission design workflows requiring low-thrust propulsion, the DSTE will provide local optimizers for low-thrust modeling. A GUI interface will be provided that allows the user to configure the optimization process to align with their propulsion control laws. This capability will focus on the export of trajectories generated in the DSTE using the CR3BP, BCR4BP, or AHR3BP equations of motion, and correction into a higher-fidelity force model in FreeFlyer. Candidate trajectories include NRHOs, other halo orbits, DROs, etc., as well as quasi-periodic orbits and transfers generated from Poincaré maps and the map stacker tool. This feature will allow the user to select a desired orbit in DSTE and correct and visualize the orbit in various reference frames in FreeFlyer. The direct integration with FreeFlyer will be optional. Users will not be required to install FreeFlyer or use this particular feature. Currently, the DSTE connects trajectory arcs within a single Sun-planet or planet-moon system through the map stacker. This capability will be augmented to connect trajectory arcs between multiple Sun-planet or planet-moon systems, allowing the user to generate end-to-end trajectories between the Earth and deep space destinations.